Today’s defence related news includes a report from King’s College into veterans mental health, an update on UK air strikes against Daesh and army recruitment. The Times and The Telegraph report this morning on RAF air strikes that destroyed a significant number of Daesh command posts, tunnel networks and weapon caches during the UK’s busiest month over Syria since February – hitting targets at a rate of more than one per day. The fight against Daesh is by no means over and we must continue to stand up for our people and our partners, to ensure their abhorrent and poisonous ideology does not spread to our streets. So long as they pose a clear and immediate threat to our national and international security, we will work tirelessly to stamp them out. We will not ease off and allow them to reorganise, as this month's operations show. King’s College has released a report into the effects of deployment to Iraq and Afghanistan for ex-service personnel. The Telegraph carries comments from senior author Professor Simon Wessley, of King’s College, who says it would be wrong to say there is a ‘tsunami’ of PTSD in the UK military. The report is covered by The Independent, The Press & Journal and the Daily Star and Minister for Defence People Tobias Ellwood was also interviewed on Sky news this morning (0815) to debate the issue. We take the wellbeing of our personnel extremely seriously and we fund research so we can continue to improve the way we support them. Military personnel receive stress management training before, during and after operational deployments, and consultant psychiatrists are available by phone 24/7, should individuals require support. We encourage anyone struggling to come forward and seek help, including through our two 24 hour helplines, and veterans can access specialist medical care through the NHS. Following the Mail on Sunday’s reports, The Times, The Daily Express, The Telegraph, Press & Journal and the Sun all follow up on the Army’s recruitment policy. Financial incentives will not be paid to anyone who has left the armed forces following a failed drug test. Zero tolerance is the right approach to dealing with drugs and anyone who fails a military test can expect to be discharged. Neither the Army, or its recruiting partner Capita, have directly approached individuals to invite them to re-join the Armed Forces. The Daily Express outlines the conservation initiatives which are being undertaken at Salisbury Plain. 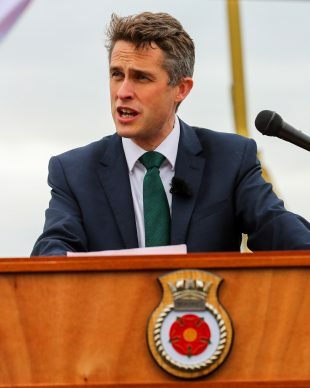 A Gavin Williamson comment piece also features and talks positively about the environmental and conservation work that the Ministry of Defence has undertaken across its training estate. Defence Secretary Gavin Williamson announces Devonport will home all New Type 26 Frigates.